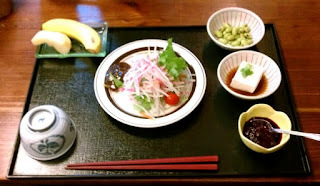 In July 2013 I started a short, sister blog about being vegan in Japan (mostly around Tokyo), based on the contents of this (long and not very usable) article. From now on, this post will not be updated. I currently live in Yokohama, Japan (near Tokyo) and will for another year, however I have no intention of making a full-blown "Vegan Japan" blog. Veg'n restaurants seem to come (and unfortunately go) faster than I can keep up with them, and I rarely visit restaurants far from Yokohama and Shibuya, so please check other good blogs, such as this one. I recommend the Happycow Android App as it tells where the nearest restaurants are at any time, and Google Maps can be easily used to get directions to the nearby restaurants it finds. It always pays to call ahead first though in case they are closed or fully booked (yes it does happen, especially on Saturday nights). I never cease to be amazed at how calm and peaceful even busy and densely-populated areas of downtown Tokyo can be, especially during the evening. This is especially true of the city's parks. While Tokyo has some of the best vegan restaurants in East Asia (and perhaps the best variety after Bangkok) just getting by as a vegan is much harder in Japan than it is in Taiwan, since there are far fewer veg'n restaurants (none in my city of four million people), because fish products are the defining feature of Japanese cuisine, and because there is much less understanding - and acceptance - of vegetarianism here than in Taiwan. It's not uncommon for people to burst out laughing (in disbelief) when I explain that I'm vegan, as opposed to the almost universal respect from Taiwanese. 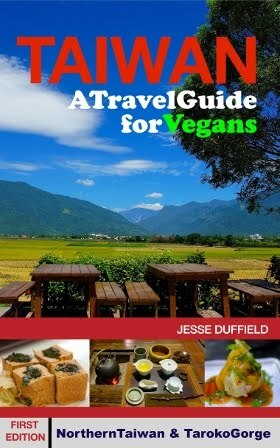 From my experience, even non-veg foreigners are much more understanding of vegetarianism in Taiwan than in Japan. I would say that Japan is, more than perhaps anywhere, a country in which it is worth making the effort to take the subway and even plan a day sightseeing around eating at veg'n restaurants. First, while it's not to say that travellers are a charity, the reality is that for some restaurants (especially around Shibuya) foreigners seem to make up a significant proportion of customers, so given how often restaurants close, that extra time you spend finding that vegan restaurant may just make a difference to it staying in business, and then continuing to promote veganism in Japan. Also, it's so hard to find vegan food at 'normal' Japanese restaurants, and thirdly, because Japanese vegan food, or Japanese-made fusion food, is so good, so it's such a loss to scrape by on "fried potatoes" (chips) or bowls of white rice elsewhere. Shibuya is the home of the young, fashion-conscious crowd in Tokyo. If you're visiting Tokyo, you'll visit Shibuya, probably to see the famous Shibuya Crossing, and the surge of humanity that through this famous intersection each time the pedestrian lights turn green. As well as the famous Shibuya Crossing, be sure to take a stroll through Yoyogi Koen (Yoyogi Park), one of my favourite places in Tokyo. Yoyogi Park is like Tokyo's backyard, where people come to stroll, jog, picnic, play music, kick a ball around, or rehearse theatrical performances. It's also worth taking a walk around nearby Harajuku, the heart of the young fashion scene (even more than Shibuya). Taipei's Ximen Ding has been described as "Taipei's Harajuku". The closest vegan restaurant to Harajuku and Yoyogi Park is Hannada Rosso (below), which serves delicious macrobiotic food. Nagi Shokudo probably serves the most authentic Japanese vegan food in Shibuya, and the set meals are particularly good, with so many different foods to try. It's doesn't have the most beautiful interior (so perhaps not one for a business lunch) and it can be a bit difficult to find without a smartphone, but such great Japanese food at an all-vegan resturant makes it well worth the trouble and the 5-10 minute walk (from Shibuya Station) to get there. Kuumba Du Falafel in Shibuya is one of my favourite places to go for a simple, delicious meal. It's about a 15 minute walk from Shibuya Station. Kuumba Du Falafel even serve Phoenix drinks from Auckland. Pure Cafe is a French-style cafe and restaurant near Omote-Sando, one stop from Shibuya, and it's one of the only veg'n restaurants in Tokyo open for breakfast. It's a must-visit while in Tokyo. 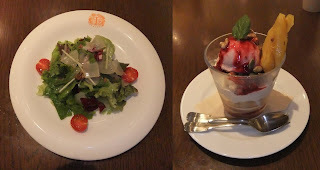 If you're hungry after a stroll through Yoyogi Park and/or Harajuku, head to the macrobiotic restaurant Hannada Rosso. Also a short hop on the Den-en Toshi line from Shibuya, and worth trying for something different, is the Hawaiian-themed, all-vegan Olu Olu Cafe. Food was excellent, and when my parents and I went in October 2012 the menu was half translated into English (so it probably all is by now), and the delightful owner was very happy to explain the other half. We found the starters to be better than the main courses. If you're hungry in Shibuya Station, pick up a cup of soymilk (I like the "Mixed Berry Soy Milk Pearly") from Mr Bean, the Singaporian soy milk company. Beware that the ice creams and all the foods contain egg or diary products. North of Shinjuku in Shin Okubo (Korea town) is Saishoku Kenbi. They used to do an incredible lunch buffet, but they're still worth visiting for the a la carte menu. While they do serve egg and dairy products, they have plenty of vegan options. This area will probably top any visitor's itinerary, and if you live in Tokyo you'll probably pass through Tokyo Station fairly often, so it's fortunate that there are two great vegan eateries nearby. The Loving Hut recently moved here from Yotsuya Sanchome (near Shinjuku) and will open its doors in July 2013. Besides hungry (starving) vegan tourists, hopefully it will attract some of the millions of Tokyo 'salarymen' who inhabit the area by day (and night). As with all Loving Huts, meals are fresh, healthy, delicious and very reasonably priced. The Yotsuya store was small on the LH scale (for larger operations head over to Seoul), but still served a small but delicious range of food. They also sold Taiwanese tea, vegan pet food and a few vegan ingredients (and I expect the new store will when it opens too). Note: as part of their ongoing promotion of veganism, the Loving Hut hold vegan food stalls at various events, often held in Yoyogi Park (with the best being the annual Vegetarian Festival in October, below). At these times they close, so it might pay to call ahead. I discovered Earth Day two years ago by going to the Loving Hut, and the staff (cooking at the restaurant) told me it was closed because they were at Earth Day. A Loving Hut stall at the (otherwise quite disappointing) Eco Life Fair in Yoyogi Park, June 2013. When you're passing through Tokyo Station (eg for a Shinkansen ride, or for the Narita Express to or from Narita Airport) be sure to enjoy a bowl of ramen from T's Tantan. It will probably the only place you'll find it vegan, since the broth is virtually always made with fish flakes (called dashi) and perhaps other animal stock powders, though chefs at most restaurants won't think of this when they offer it to you in the same conversation that you explain you don't eat fish. (2013 update: Chabuton ramen chain now offer a vegan ramen too, but it's not nearly as good.) T's Tantan promote veganism to their mostly non-vegan clientele in a gentle but powerful style with symbols and phrases (curiously in English) all over the walls, leaving diners with no doubt that they are enjoying a plant based meal. It's inside the ticket gate (but not the Shinkansen gate), so don't exit the station. Head towards the Keio Line, and then Keio Street (an underground food "street"). If you happen to come from outside the station (which seems unlikely) you'll need to buy a ticket into the station. While they clearly aim to serve vegan versions of trusted traditional Japanese favourites to non-vegan passers-by, their menu is always expanding, and I was delighted to recently (June 2013) find a fairly authentic Thai Massaman Curry on their menu! They have also added soy pudding (better than it might sound) on weekdays (lunchtime only). Thai Massaman curry, soy pudding and orange juice from T's Tantan - a great lunch for 1500 Yen. If you're in the mood for spending up, or watching others spend up, head to Ginza, and while there, try a delicious meal from Ain Soph. There's also a branch of Nattaraj (below) if Indian is more appealing. From 2PM - 5PM on Saturday, and midday to 5PM (6PM April to September) on Sunday the main streets are closed to cars and become pedestrian zones. To me, Chiba feels like Tokyo's sprawl, and while it's no doubt a convenient place to live, it would hardly top a Tokyo tourist itinerary (unless you want to go to Tokyo Disneyland), and indeed my first visit was by accident, when I took the wrong train from It's Vegetable to Yokohama (or so I thought). However, I serendipitously discovered Hifumi Organic Cafe using the Happycow App. Note that Happycow (rightly) lists Chiba as a separate city from Tokyo, so restaurants there won't show up under Tokyo (but will show up on the Happycow Android App if you are in the area). Personally I found the monorail the most interesting thing in Chiba, but others may prefer Tokyo Disneyland. However, it shouldn't take an accident: Hifumi Organic Cafe and Foods (happycow), is well worth the trip from Tokyo. Hifumi Organic Cafe and Foods opened after the earthquake (March 2011). A charming little cafe run by equally charming vegan owners, it serves western-style food (but beautifully presented Japanese-style), using fresh, organic, locally-produced vegetables. It has the serene, peaceful atmosphere typical of organic cafes around the world. Food was fresh, healthy and delicious. A delicious millet quiche lunch set from Hifumi Organic Cafe. Prices were very reasonable, at about a thousand yen for a lunch set (above). They also have a small range of organic grocery items. Hifumi Organic Cafe & Foods also has a small shop, and sells freshly-baked goods. It was my first time to taste carob (in a delicious scone) in longer than I can remember. If you're 'going out' in Tokyo, you're probably going to Roppongi. Also in Roppongi is a new branch of Chien-Fu (Happycow) a chain of Taiwanese vegetarian restaurants. Food is typical tofu and mock meats, but my Ma Po tofu (a taste of Taiwan for when I miss it) was delicious, and very similar to what I used to eat from my closest vegetarian restaurant soon after I arrived in Taiwan. Not so Taiwanese: this kimchi was delicious. And as Taiwanese as can be: Ma Po tofu is a 'taste of home' for anyone who's lived in Taiwan. I'm reluctant to recommend a non-vegetarian restaurant with so many vegetarian restaurants to choose from in Tokyo, however if you are in Roppongi, want a solid meal and don't fancy sushi (if you want something cheaper, more filling or both) then Nirvanam have a vegan/jain menu, and their masala dosas are excellent. They are close to Kamiyacho Station, one stop from Roppongi on the Hibiya Line. They also have a new store near Toranomon Station. I recently discovered, due to its addition to Happycow, that there is, after all, a South Indian vegetarian restaurant in central Tokyo. Vege Herb Saga is a two-minute walk from JR Okachimachi Station (Ueno), and it will soon become a regular haunt of mine. Note that the address shown on Happycow is correct (I think) but the Happycow App gives a wrong address. If in doubt, I recommend printing the address from their website. Vege Herb Saga is a little piece of India, right here in Tokyo, down to the beaming chef in a white jacket, the clutter and, most importantly, steaming hot delicious SI foods, such as Dosas and Idli. A sign on the wall (in Japanese) explains that during busy times (which seems to be most of the time) customers are asked to sit together until all seats are taken, and that meals may take a while as each dish is cooked separately. As such, it might not be everyone's idea of an ideal spot for a first date or business lunch, but it's also an interesting opportunity to meet a range of interesting people who have also sought out Tokyo's only South Indian vegetarian restaurant. The sign also warns that food can take some time to prepare - and that it does: allow up to an hour, or two if you order a time-consuming dish on a busy Saturday night (your other dishes will come out during this time). But you'll soon see why: however busy the chefs are, your meal will be cooked to perfection from fresh ingredients. So don't let any of this put you off: Vege Herb Saga is the place to come for the best Indian food in Tokyo. There's just nothing like a good Masala Dosa! I recently met the owner, who explained that there are several hundred Jains (strict vegetarians who live their lives in such a way to minimise all harm to living creatures) living in the surrounding community - including himself - mostly in the diamond trade. He started the restaurant three years ago because, while business was going fine, he needed somewhere to eat! So his restaurant is intended as a place for vegetarians to find safe food, rather than for profit. This may seem like the perfect marketing story for any business, it does explain why he's done so little marketing that for a whole year I Googled "South Indian Vegetarian Tokyo" and didn't find it, and it was only added to Happycow a few months ago. His reputation has clearly spread by word of mouth, especially among the vegetarian Indian community, and on my first visit I had dinner with two friendly jewellery salesmen visiting Tokyo for an expo, one a Hindu and one a Jain, who had eaten there every night of their visit. It was obvious that this is where visiting vegetarian Indians come to eat, but about half of the tables in the (full) restaurant were occupied by local Japanese groups. However, despite the location and lack of marketing, it's not just sought out by vegetarian Indians with nowhere else to eat: on my second visit I sat with a group of students - one a connoisseur of Indian food - who had come because in some major competition it had won fifth place of all Indian restaurants in Tokyo - not bad for a vegetarian jaunt in a cramped and cluttered basement! The reason, the owner explained to me, is that he uses only top-quality ingredients, and has fresh spices delivered from India regularly. This, and the food being cooked to order, makes this one of the best Indian restaurants I've ever been to, and a must-visit while in Tokyo. The friendly and helpful staff clearly understood veganism, and vegan items on the menu are labelled with a sticker. A drink, snack and dosa meal costs around 2000 Yen. There is one other vegetarian restaurant which serves some South Indian food, and that is the new(ish) Govinda's Edogawa-ku, which is associated with the Hare Krishna temple. I also had a good Masala Dosa there, and twice went to their Saturday buffet: once it was excellent, and once it was hardly worth the half-hour journey to get there. Vegan foods were not labelled, but staff were happy to say which were, and cook rotis (instead of naan) to go with the curries. The closest station is Funabori. There used to be an Indian/Macrobiotic Restaurant also called Govinda's, which I unfortunately never made it to before it closed. Their blog is here. please don't confuse old reviews of this restaurant online with Govinda's in Funabori. If you're tired of small Japanese portions (as good as that is on so many levels) or want a more upmarket Indian dining experience then head to one of the Nattaraj vegetarian restaurants. A-la-carte meals include the typical North-Indian fare found all over Japan. In many ways, Nattaraj restaurants are as different to Vege Herb Saga as two vegetarian Indian restaurants in Tokyo can be. To the true connoisseur of Indian food, Nattaraj will have a chain-restaurant feel, and the food will probably taste bland and watered down, especially compared to the authentic experience at Vege Herb Saga, which is clearly the restaurant of choice for travelling Indian vegetarians. On the other hand, Nattaraj food tastes fresh and healthy, is less oily than most other Indian food, and it's probably much more palatable to those not used to the fire and spice of true Indian food, including locals more accustomed to Japanese flavours. You also get your own table to enjoy with the company you came with, and your meal will arrive fairly quickly. All said, the fresh and delicious food which anyone can enjoy, central locations and clean, welcoming interior make the Nattaraj restaurants an excellent place to dine out in groups, large or small. I find the Aoyama branch the best balance of price and central location, but there are also branches in nearby Ginza (more expensive) and out in Tateshina and Ogikubo. There's also a branch in Osaka. The very satisfying weekday-only 1000 Yen lunch buffet (below) is especially good value, and includes vegan Naan (most food is vegan and all is clearly labelled). If you're just visiting Tokyo and Nattaraj is on your list, the lunch buffet is the time to visit. I recently realised that I had forgotten to include one of my favourite restaurants in Tokyo, largely because it has unfortunately been some time since I went there, and that is Little Heaven. It's a charming little restaurant, with a delightful range of burgers, pizzas and other dishes, including macrobiotic and other Japanese dishes. The owners grow many of their vegetables on their own farm north of Tokyo. Prices are very reasonable. While I'm not aware of much to see around it, being on the Yamanote Line (only 17 minutes from Shibuya) it's very easy to get to from almost anywhere, and certainly worth the short trip. I will find and post photos soon. If you're headed to Yokohama (for Chinatown and Yamashita Park, or for the Yokohama anti-fur march) it's best to eat before you come, since there are no vegetarian restaurants in the city. One option is to stop at T's restaurant (owned by the same company as T's Tantan) on the way (Jiyugaoka Station on the Tokyu Toyoko / Minatomirai line to Yokohama). It serves excellent fusion cuisine, and is perhaps worth a visit even if you're not on your way to Yokohama. They also started serving some ramen (like at T's Tantan) during "tea time" in the afternoon, during which time they also serve cakes and drinks. No it isn't cheese, from T's Restaurant, Jiyugaoka. If you do get stuck for food in Yokohama, the best option is the Indian restaurant Sitar (close to Chinatown). The owner, Kumar (who is almost always there) understands what vegans can and can't eat and he (or his staff) will make sure that your meal is vegan. If you're taking the Shinkansen, Maharaja Indian restaurant (chain) on the 9th floor of Shin-Yokohama Station (Cubic Plaza) does vegetarian dishes (including South Indian food) and the owner was happy to explain what could be made vegan. Natural House are a much larger but less veg-friendly chain organic shop, and they have a large store in Omotesando, among others. I buy Taiwanese tea and soy yoghurt from there. For a shop more like Jasons (in Taiwan), which sells a great range of vegan products, including Indian food and even Scheese (soy cheese from the UK) go to National Azuba in Hiroo (walking distance from Natural Mart). All Starbucks cafes in Japan serve soymilk, and since giving up coffee I especially like Matcha (Japanese green tea) tea lattes. The nice thing about Japan is that they give you a "soy" card at the when you pay for the drink, and then you hand this to the barrister upon collecting it. This prevents "milk allergy incidents" (and gut-wrenching surprises for vegans) caused by miscommunication or staff forgetting the soy order, which I've experienced in both Taiwan and Korea. Starbucks also have the added benefit of being non-smoking, as most cafes in Japan have 'smoking sections' but the smoke doesn't seem to understand its restriction to one part of the cafeteria. I recently discovered that at least some (all?) Tulleys Coffee cafes also serve soymilk, and do a good Matcha Tea Latte. The Tokyo Veg Festa (vegetarian festival) in October, sees thousands of people visit dozens of stalls, most of which seem to do a roaring trade. The annual Tokyo Veg Festa draws attracts thousands. The Loving Hut seems to have a permanent long line. The annual anti-fur march (also in October) draws a few hundred people. The 2012 Anti-fur march is about to depart for a 1.5-hour walk through the nearby fashion districts. Whether visiting or living in Tokyo, it's well worth going to a vegan meetup, especially the monthly Pink Cow buffets. The food is excellent (usually my best meal of the month), and it's a good chance to meet veg-minded and English-speaking (but not usually vegetarian) Japanese, and an eclectic mix of foreigners. Note that the majority of people there are not veg'n, and some don't even 'get it', not that this matters: it's great to see so many people enjoying a vegan meal. On one of my first meetups, after introducing myself to a resident foreigner in Tokyo as we cued up for the buffet, I mentioned that I was from New Zealand and he quickly told me how much he loved NZ because the fly fishing was so good. I'm yet to master the fine Japanese art of making food *look* good on my plate, but this meal at the monthly Pink Cow vegan meetups is usually my best meal of the month. Japan is a fascinating and rewarding country to live, and I wouldn't suggest letting food put one off coming (to visit or to live), however it's strongly advisable to live in one of the major cities (unless one is content to cook at home and almost never eat out with friends/colleagues). It's not just the trains: this Yokohama anti-fur march - walkable from my apartment - was due to start at 1PM. Less well known are that in Japan (like Taiwan), virtually all breads, including those sold at convenience stores, contains milk and/or egg products. There are a few exceptions, generally specialty European bakeries (which will sell you the most expensive bread you'll buy in your life) and a few supermarkets, which often label whether their breads contain milk or egg products (for people with allergies). 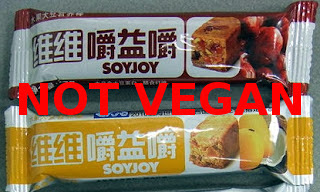 Also, Soyjoy bars, available at convenience stores, contain egg. The Vegan Healing Cafe was one of Tokyo's first vegan cafes, and quite an institution in AR circles. It appears to have closed in mid-2013, however their website is still active, so I'm keeping the info here. Perhaps the most 'animal rights' focussed cafe, it had some vegetarian cookbooks and AR literature, and the owner - a former rally car driver gone AR advocate, vegan cafe owner and organiser of many vegan events in Japan - often parked his Peta/No-fur-painted van outside. This was a must-visit for anyone visiting Tokyo, and a regular hangout for AR folks around Tokyo. If you're new or visiting, it was also a good place to find out about any AR events happening in the city (if you're lucky enough to visit while there are any). Vegetable Sushi Potager was an authentic, fine-dining sushi experience (or as authentic as vegetarian sushi can possibly be!) in downtown Roppongi, but I suppose it was too good to be true, and it closed its doors around June 2013. However, the owners have opened a new restaurant near their original store in Nakameguro. Happycow states that it is no longer veg, however it appears from their new website that the menu is at least still very veg-friendly, so until I try it I'll leave my photos from their old location below. Kamakura is a charming seaside little town about an hour from Tokyo, famous for its beach and temples. It was the de facto capital of Japan during the Kamakura Period from 1185 to 1333, during which time Japan was ruled by the Kamakura Shoganate and the famous samurai class emerged. Kamakura is a popular day or overnight trip from Tokyo. The 750-year-old Daibutsu (big Buddha) is Kamakura's icon. The temples are beautiful, and there are some nice walks around the place. The Daibutsu Hiking Path is a beautiful escape from the city. It takes about an hour from Jochi-ji Temple to the Daibutsu. It's also possible to cycle to Kamakura from Tokyo (or Yokohama) but there isn't a good route, so expect lots of traffic. For a few weeks during the summer vacation period the beaches really comes alive, with locker, changing and shower facilities being erected on the sand, and crowds flocking to swim, sunbathe and just enjoy the beach environment. Yuigahama is the easiest beach to reach, being a short ride on the tram (Enoden / electric railway) from Kamakura station. The beach also becomes a real party-zone, with beach-side bars and dance floors if that's your thing. All constructions disappear promptly after the vacation period, at which time the beach returns to its former pristine state. Beware of jellyfish in the water during the really warm months - I learned the hard way. Yuigahama Beach at Kamakura comes alive during the hot summer months. A few minutes walk from Yuigahama beach is the charming little organic, vegan cafe and shop Naturalia. As of June 2013, it had two dishes: taco rice and vege burgers. Taco rice from Naturalia: healthy, delicious and only 800 Yen! It also serves vegan icecream, made in a 'soft serve' (I think) machine using soy and rice milks. For such a tiny shop, Naturalia also has an impressive range of organic produce and (mostly imported) organic groceries. Naturalia is part of a chain, which is apparently Japan-based (and not associated with European shops by the same name) it's important to note that other branches are not vegan. Naturalia is open from 11AM - 6PM, and closed on Mondays. Also, right across from Yuigahama Beach itself, is the veg-friendly Organic and Hemp Style Cafe and Bar. The interior could be described as 'hippy", with a few hemp products for sale, and the food is excellent. While unfortunately it's not vegan anymore, the staff all have a good understanding of veganism and I've never had any problems ordering delicious food. Zushi is like a smaller, quieter Kamakura, also with a beach and a few temples. And I was pleased to learn from a colleague recently that, like Kamakura, Zushi has a (mostly) vegan cafe. Beach Muffin serves a delicious range of baking, and vegan meals. The bakery is open from 9:30 to 7:00, and the cafe from 11AM (also to 7PM). Unfortunately I arrived after the kitchen had closed (I guess about an hour before closing time), so only the bakery was open, but the cafe menu includes burgers and burritos. One thing that impresses me about Beach Muffin is how well they promote veganism to their non-vegan clientele. However, beware that a few of the baked goods contain egg and dairy, and they are labelled in Japanese only, so it's important to specify that you are vegan when you order. It's possible to take a bus from Yuigahama to Zushi, but as of June 2013, Google Maps isn't working properly for buses. Alternatively it will take about half an hour to reach Beach Muffin from Yuigahama (changing trains at Kamakura). It would also be a very pleasant 5 kilometre bike ride (or walk) along the beach. Thanks for sharing this nice blog..Its really very interesting and useful for me..